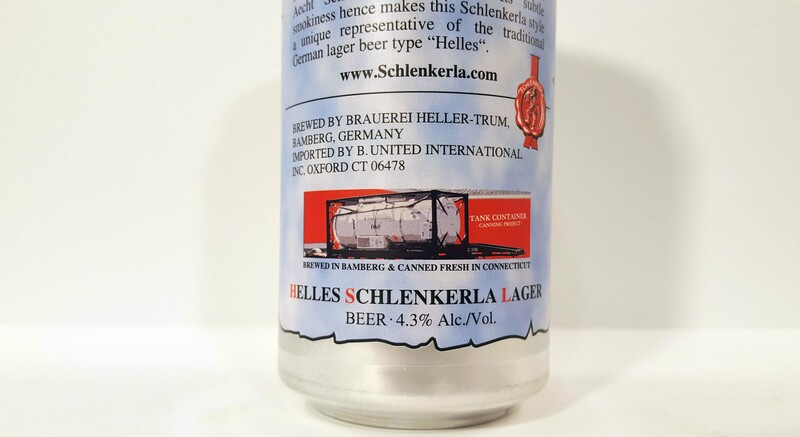 Product description: Helles Schlenkerla Lager is brewed with fine Bavarian aroma hops and lagered in the 14th century beer cellars underneath the Schlenkerla brewery and maltings. It is boiled in the same copper kettles and bottom fermented by the same yeast as the classic Aecht Schlenkerla Rauchbier. Its subtle smokiness hence makes this Schlenkerla style a unique representative of the traditional German lager beer type “Helles”. Note: This version is an unfiltered edition imported via climate-controlled tank by B. United and canned on site in Connecticut. This is a very special beer. Brewed in Bamberg, Germany and then canned in Connecticut thanks to B. United specialty importers, the idea was to bring super fresh Franconian beer to the U.S. Previously, we have been able to buy most of Brauerei Heller’s core beers in bottled format, including the regular version of the helles (light) lager. None of them are particularly fresh, though, with the helles lager being the most prone to structural damage from excessive heat and time languishing on store shelves. What B. United did for this beer is state of the art. B. United used a massive climate-controlled tank to transport this beer to the U.S., which was then canned at B. United for distribution. This short document explains B. United’s tank container project. It is truly fascinating. It’s clear why B. United went to such lengths to get super fresh examples of this beer to the U.S. Brauerei Heller is hands down the world master of smoked beer. Hailing from Bamberg, practically any beer in the world you’ve had that was “smoked” was made with Bamberg-sourced smoked malt. Their helles lager, though, is not directly made with the smoked malt. Rather, this beer picks up the smokey flavor by using the same brewing equipment as the rauchbiers (smoke beers) and by reusing the same yeast as the rauchbiers. The end result is one of a kind. I’m sampling this from a 16oz can that I picked up at my local bottle shop for about $6 for the single can. On the bottom of the can there is no packaging date, but these cans first starting popping up in January of this year, so it is probably 6 months old at the most. Into the glass, Helles Schlenkerla is fairly clear straw colored with larger, bleach white foam that rises up out of the glass and settles down halfway in about a minute. Only a touch of chill haze keeps this from being crystal clear. There’s a bubble bath texture to the head of foam, and it stops dwindling down suddenly as if frozen in time. I poured out the beer to the bottom of the can and some small sediment chunks fall out, but they don’t cloud up the beer. The aroma gives you a stunning mix of fresh sourdough bread with applewood smoked bacon. There’s incredible interplay of sweet and savory with maple-glazed smoked meat, yellow apple, and green pear. As it warms up, the nose migrates to powerful fennel pollen and robust lavender honey. It’s one of the best I’ve experienced. In the front of the palate, Helles Schlenkerla is richly malty and super silky focused on salty sourdough bread segueing quickly to an intense grassy bitterness that pushes to almost soapy. A bitter flavor similar to tannic fruit skin builds in the finish as does sourdough-like acidity. Smokiness remains impossibly well-integrated, adding a nice overtone of applewood smoked bacon to every facet of the experience. Bitterness is at 4/10 initial intensity but builds in the finish to 6/10 as the beer dries out. Sweetness is at a 5/10 providing medium body. Smokiness, if 10 was band-aid style phenols and peated Islay Scotch, is at 4/10. The whole mouthfeel is ultra clean and endlessly drinkable with far more complexity than other blonde lagers. This is a beer that displays balance, subtlety, and grace. It’s for drinking in large gulps in social settings. It’s not a novelty beer like some of its siblings in Heller’s core lineup. This is the best beer they make because it is the one you want after working all day and the one you will long for after the novelty of the others has worn out. This is a desert island beer for me – the greatest of all time.